Ricin is one of the most poisonous naturally occuring substances known. The seeds from the castor bean plant, Ricinus communis, are poisonous to people, animals and insects. One of the main toxic proteins is "ricin", named by Stillmark in 1888 when he tested the beans' extract on red blood cells and saw them agglutinate. Now we know that the agglutination was due to another toxin that was also present, called RCA (Ricinus communis agglutinin). 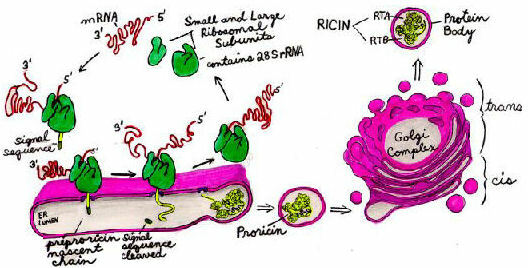 Ricin is a potent cytotoxin but a weak hemagglutinin, whereas RCA is a weak cytotoxin and a powerful hemagglutinin. Poisoning by ingestion of the castor bean is due to ricin, not RCA, because RCA does not penetrate the intestinal wall, and does not affect red blood cells unless given intravenously. If RCA is injected into the blood, it will cause the red blood cells to agglutinate and burst by hemolysis. Perhaps just one milligram of ricin can kill an adult. The symptoms of human poisoning begin within a few hours of ingestion. If death has not occurred in 3-5 days, the victim usually recovers. It is advisable to keep children away from the castor bean plant or necklaces made with its seeds. In fact donít even have them in or around a house with small children. If they ingest the leaves or swallow the seeds, they may get poisoned. The highly toxic seeds beaded into necklaces, cause skin irritation at the contact point. If the seed is swallowed without chewing, and there is no damage to the seed coat, it will most likely pass harmlessly through the digestive tract. However, if it is chewed or broken and then swallowed, the ricin toxin will be absorbed by the intestines. It is said that just one seed can kill a child. Children are more sensitive than adults to fluid loss due to vomiting and diarrhea, and can quickly become severely dehydrated and die. 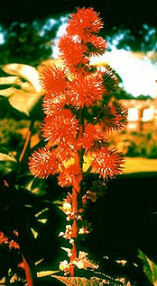 Castor bean plants in a garden should not be allowed to flower and seed. The "stalked leaves consist of usually eight radiating, pointed leaflets with slightly serrated edges and prominent central veins. Many varieties are green, but some are reddish brown. "(Cooper and Johnson) The flowers are green and inconspicuous, but pink or red in the pigmented varieties. Many stamens are near the base and branching pistils are near the top of the flower. The soft-spined fruits containing attractively mottled seeds are distinctive features of the plant. It is grown as an ornamental in gardens, sometimes as a houseplant, and also grows as a weed. It is an annual in the south and a perennial in the tropics, and it may reach "15 feet tall outdoors". It is a woody herb belonging to the family of Euphorbiacea (Spurge). It is advisable to keep children away from the castor bean plant or necklaces made with its seeds. In fact don't even have them in or around a house with small children. If they ingest the leaves or swallow the seeds, they may get poisoned. The highly toxic seeds beaded into necklaces, cause skin irritation at the contact point. Castor bean plants in a garden should not be allowed to flower and seed. A good practice is to "nip it in the bud". In 1978, ricin was used to assassinate Georgi Markov in 1978, a Bulgarian journalist who spoke out against the Bulgarian government. He was stabbed with the point of an umbrella while waiting at a bus stop near Waterloo Station in London. They found a perforated metallic pellet embedded in his leg that had presumably contained the ricin toxin. Aphids, drawn to the right on a leaf of the castor bean plant, are susceptible to poisoning from ingesting the phloem. The sap-suckers died within 24 hours of feeding. The European corn borer and the Southern corn rootworm larvae were killed when exposed to feed painted with 2% ricin. Studies like these are undertaken to develop "natural" pesticides. A study with sheep showed that autoclaved castor-bean-meal can be incorporated to 10% of sheep rations without any ill effect. Poisoning of livestock usually occurs by accidental incorporation of castor beans in their feed. 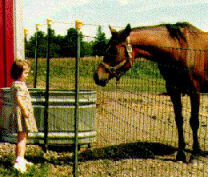 Horses are particularly vulnerable. Castor beans are pressed to extract castor oil which is used for medicinal purposes. Ricin does not partition into the oil because it is water-soluble, therefore, castor oil does not contain ricin, provided that no cross-contamination occurred during its production. More information describing them is available under the listing for Castor Bean, in the Canadian Poisonous Plants Information System, courtesy of Derek B. Munro. Many cytotoxic proteins from a variety of plants have been identified, and they are related to ricin both in structure and function. They inhibit protein sythesis by specifically and irreversibly inactivating eukaryotic ribosomes. These "ribosome-inactivating proteins" (RIPs) are typically N-glycosylated, 30 kDa monomers (Type 1 RIPs). However, in order to bind to the cell surface galactosides and enter the cytosol to reach ribosomes, they require a second monomer, a galactose-binding, 30 kDa lectin. The monomers are joined by a disulfide bridge to form the toxic heterodimers (Type 2 RIPs). Some plants, such as wheat andbarley, have only Type 1 RIPs, and are not poisonous, while others, such as the castor bean plant seed, contain the Type 2 RIPs that are among the most potent cytotoxins in nature. 5% of the Ricinus seed consists of ricin and RCA (Ricinus communis agglutinin). Ricin is a heterodimeric type 2 RIP. This ribosome-inactivating enzyme (32 kDa), also known as the A chain, is linked by a disulfide bond to the galactose/N-acetylgalactosamine-binding lectin (34 kDa), also called the B chain. Ricin and RCA are synthesized in the endosperm cells of maturing seeds, and are stored in an organelle called the "protein body", a vacuolar compartment. When the mature seed germinates, the toxins are destroyed by hydrolysis within a few days. Ricin begins sythesis as a prepropolypeptide that contains both A and B chains. The signal sequence of the Nh3-terminus targets the nascent chain to the endoplasmic reticulum (ER) and is then cleaved off. As the proricin polypeptide elongates it is N-glycosylated within the lumen of the ER. Protein disulfide isomerases catalyze disulfide bond formation as the proricin molecule folds itself. Proricin undergoes further oligosaccharide modifications within the Golgi complex and then is transported within vesicles to the protein bodies. Ricin is not catalytically active until it is proteolytically cleaved by an endopeptidase within the protein bodies. This splits the polypeptide into the A chain and the B chain still linked by a single disulfide bond. Since ricin is inactive until then, the plant avoids poisoning its own ribosomes in case some proricin accidentally passes into the cytosol during synthesis and transport. The ricin A portion of the heterodimer is the enzyme that binds and depurinates a specific adenine of the 28S rRNA. The adenine ring of the ribosome becomes sandwiched between two tyrosine rings in the catalytic cleft of the enzyme and is hydrolyzed by the enzymeís N-glycosidase action. The target adenine is a specific RNA sequence that contains the unusual tetranucleotide loop, GAGA. Ricin is more active against animal than plant ribosomes, and intact bacterial ribosomes are generally not susceptible. 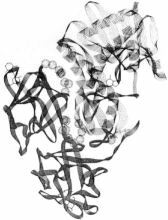 This figure from Lord et al, depicts a 3-dimensional ribbon drawing of ricin, modeled from X-ray crystallography data. The upper right half, the dotted ribbon, is the A chain, and the lower left half, the solid ribbon, is the B chain. The A chain (or RTA)is a 267-amino acid globular protein. It has 8 alpha helices and 8 beta sheets. The substrate binding site is the cleft marked by the substrate adenine ring. The B chain (or RTB) is a 262-amino acid protein that is shaped like a barbell. It has a binding site for galactose at each end, (depicted by lactose rings). These two sites allow hydrogen bonding to specific membrane sugars (galactose and N-acetyl galactosamine). A disulfide bridge (-S-S-) joins RTA with RTB (far-right, center). The spheres are trapped water molecules. The RTB portion of ricin binds to both glycoproteins and glycolipids at cell surfaces that terminate with galactose. It has two binding sites for galactose, and 106 to 108 ricin molecules may bind per cell. However, just a single ricin molecule that enters the cytosol can inactivate over 1,500 ribosomes per minute and kill the cell. endocytosos by smooth pits and vesicles. The vesicles fuse with an endosome. the vesicles may fuse to lysosomes where the ricin would be destroyed. return to the cell surface. Toxic action will occur when RTA, aided by RTB, penetrates the TGN membrane and is liberated into the cytosol. Once inside the cytosol, the RTA catalyzes the depurination of the ribosomes, halting protein synthesis. Ricin can be targeted to specific cells, such as cancer cells, by conjugating the RTA subunit to antibodies or growth factors that preferentially bind the unwanted cells. These immunotoxins have worked very well for in vitro applications, e.g. bone marrow transplants. Although they have not worked very well in many in vivo situations, progress in this area of research shows promise for the future. In bone marrow transplant procedures, RTA-immunotoxins have been used successfully to destroy T lymphocytes in bone marrow taken from histocompatible donors. This reduces rejection of the donor bone marrow, a problem called "graft-vs-host disease" (GVHD). In steroid-resistant, acute GVDH situations, RTA-immunotoxins helped alleviate the condition. Also, in autologous bone marrow transplantation, a sample of the patients own bone marrow is treated with anti-T cell immunotoxins to destroy malignant T-cells in T cell leukemias and lymphomas. "For the in vivo treatment of solid tumors, considerable problems can arise due to poor access of the immunotoxin (IT) to the tumor mass; lack of IT specificity, tumor cell heterogeneity, antigen shedding, breakdown or rapid clearance of the IT, and dose-limiting side effects". (Lord et al.). One common problem encountered in patients treated with ricin-immunotoxins is the "vascular leak syndrome", in which fluids leak from blood vessels leading to hypoalbuminemia, weight gain and pulmonary edema. "Research efforts to expand and develop immunotoxins and therapies for clinical use in cancer and AIDS are continuing with strategies utilizing recombinant DNA technology (Lord et al.). Diagram shows injection of ricin into vagal nerve and subsequent destruction of neurons (dashed neurons destroyed, solid neurons unaffected). Neuroscientists can selectively destroy neurons by injecting ricin into nerves. Retrograde axonal transport mechanisms bring the toxin to the neuronal cell bodies where the ribosomes are localized. Ultrastructural analysis reveals that ricin first causes the dispersion of polyribosomes, and then the rough endoplasmic reticulum disorganizes into smooth vesicles. The cell bodies (perikaryon) swell, the nuclei degenerate and the entire neuron disintegrates. Since ricin is a N-acetyl galactosamine-binding lectin, it can be used with different lectins that have different specificities tomap neuronal patterns of glycosylation. When suicide transport is observed after injection of the toxin, it confirms the presence of N-acetyl galactosamine residues on the neuronal cell surface. Strategies in suicide transport work very well in studies of adult peripheral sensory and motor neurons because they are sensitive to ricin. Neurons in the central nervous system of adults are resistant to ablation by ricin, whereas young developing brains are sensitive, suggesting that brain development involves changes in glycosylation of CNS neurons. The galactose terminal residues may be either clipped or masked by addition of sialic acids residues. In suicide transport experiments, often some ricin leaks out of the nerve, causing systemic poisoning of the animal. This problem can be avoided by simultaneously administering a ricin antiserum. Alber, J.I., and D.M. Alber. (1993) Baby-Safe Houseplants and Cut Flowers: A Guide to Keeping Children and Plants Safely Under the Same Roof. Story Communications Inc., Pownal, Vermont. Cooper, M.R., and A.W. Johnson. (1994) Poisonous Plants and Fungi: An Illustrated Guide. CAB International Bureau of Animal Health, Weybridge; London. 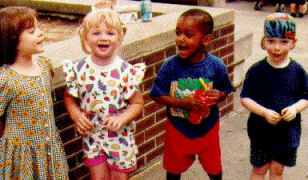 Czapla, T.H., and I.A. Johnston. (1990) Effect of plant lectins on the larval development of European corn borer (Lepidoptera:pyralidae) and southern corn rootworm (Coleoptera:chrysomelidae). J.Econ. Entomol, Lanham,Md. : Entomological Society of America, 83(6):2480-2485. Frankel, A.E., (1993) Immunotoxin Therapy of Cancer. Oncology (Huntington), 7(5):69-78; discussion79-80, 83-6. Knight, B. (1979) Ricin-a potent homicidal poison. Br. Med. J. 278:350-351. Lord, J.M., Roberts, L.M., and J.D. Robertus. (1994). FASEB J. Feb; 8(2):201-8. Matthews, R.W., and J.R. Matthews (1978). Insect Behavior, pub. Wiley and Sons, Inc. New York, pp.507. Okoye, JOA, Enunwaonye, CA. Okorie, A.U. and F.O.I. Anugwa (1987). Pathological effects of feeding roasted castor bean meal Ricinus communis to chicks. Avian Pathol. 16(2):283-290. Olaifa, J.I., Matsumura,F., Zeevaart, J.A.D., Mullin, C>A>, and P. Charalambous. (1991) Lethal amounts of ricinine in green peach aphids myzus-persicae suzler fed on castor bean plants. Plant Sci. (Limerick), 73(2):253-256. Purushotham, N.P., Rao, M.S., and G.V. Raghavan (1986). Utilization of castor-meal in the concentrate mixture of sheep. Indian J. Anim. Sci. 56(10):1090-1093. Robertus, J.D. (1988). Toxin Structure. Cancer Treat. Res. 37:11-24. Robertus, J. D. (1991) The structure and action of ricin, a cytotoxic N-glycosidase. Sem. in Cell Biol. 2:23-30. Vitetta, E.S. and P.E. Thorpe, (1991) Immunotoxins containing ricin or its A chain, Sem. in Cell Biol. 2:47-58. Wiley, R. G., and T. N. Oeltmann, (1991) Ricin and Related Plant Toxins: Mechanisms of Action and Neurobiological Applications; In, Handbook of Natural Toxins, Vol.6, ed. R.F.Keeler and A.T.Tu, Marcel Dekker, Inc., New York.